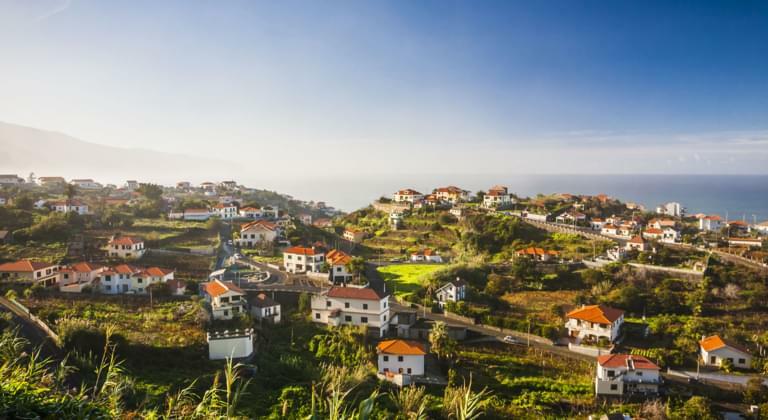 Explore Madeira by rental car and discover beautiful places on the island. With a car, you are flexible on the island and can also get to places of interest that are difficult to reach by public transport. Compare the offers of car rental companies in Madeira on Car rentalCheck. Rent a car at Funchal Airport and be mobile from the first moments of your holiday in Madeira. You can pick up your rental car from one of our partners on arrival. We work together with all major car rental companies at Madeira Airport. Simply select the car rental company that has the best deal for you. Due to the mild climate, Madeira is pleasantly warm not only in summer, but all year round. So you can explore the beautiful island at any time of the year with a sporty convertible. Single travellers, couples or small groups should choose a practical small car. This way you not only have a reliable, but also an inexpensive and comfortable companion for your trips in Madeira. If you are travelling with your family or a larger group, it is of course advisable to rent a spacious combination car. Madeira can be explored for all passengers comfortably and with enough space - so that not only all passengers have enough space, but also the luggage. The Portuguese Atlantic island Madeira has a number of beautiful nicknames, which describe the island very well. The "floating garden" or the "Pearl of the Atlantic" offers car rental travellers a beautiful nature, a variety of interesting excursion destinations and exciting sights. The largely green island with its steep, rocky coastline offers impressive landscapes for the journey with your rental car: high mountains, wide valleys and fascinating floral landscapes make the island a very special destination. In the south of Madeira lies the island's capital, Funchal. Situated in a beautiful bay, directly on the Atlantic Ocean and in the background in front of spectacular mountains, Funchal with its many restaurants and bars is definitely worth a visit with your rental car. Another highlight of Madeira and not far from Funchal is the Botanical Garden. You will be amazed by the garden architecture and the impressive variety of species in the park. Due to the beautiful and unique nature of the island, Madeira has a number of ecological parks and nature reserves that are all worth visiting. For example, visit Ecological Park, Ribeiro Frio Forest Park, the Garajau's Nature Reserve and Rocha do Navio Nature Reserve. A crossing to the island of Porto Santo is recommended as an insider's tip. On the small island a heavenly, 9km long sandy beach awaits you - we wish you a pleasant stay!